Can the Warren campaign be upfront about anything? Yesterday a video was released of a man assaulting a videographer filming Warren. Warren was just feet away from the assault as was her staff, and did nothing at the time. The Warren campaign distanced itself from the man, saying he was a mere cab driver. Republicans reacted angrily today after a video tracker was apparently pushed, threatened, and had his camera knocked down while shooting video of Democratic US Senate candidate Elizabeth Warren. The Warren campaign said the man involved was a private cabdriver, unaffiliated with the campaign…. The Warren campaign, which is challenging Republican US Senator Scott Brown, responded with a statement from spokeswoman Julie Edwards. How friendly were the Warrens with this “cab driver”? It’s hard to say. But what is clear is that the Warren campaign deliberately sought to mislead the public about her connection to this cab driver. The Warren campaign made it seem like they called for a cab, this guy just happened to pick her up, and a fight just happened. Are we to believe this driver just decided out of the clear blue to take it on himself to go after a cameraman? Not only did Elizabeth Warren throw the Cherokees aside when she no longer needed them, she just threw her friend the cab driver under the bus. I think this statement applies to Warren and her staff as well. Hey troll, no one denied he was a driver, just that she knew him more than her campaign let on in its statement. The photo of the Warrens with him was not in a different location than the event yesterday. So when he threatened, “You’re messing with the wrong people,” you are saying he refers to his cab company? Juan: do you think Morgan still has a job today because he’s the boss of that company? Not many people doing what he did would still be employed the next day. I believe he’s a bit more than just a cabbie. Yeah, you gotta watch out for those Martha’s Vineyard cabbies. What with all those connections to the power elite they enjoy, they think very highly of themselves. Why, they probably feel like they’re above the law, or at least entitled to be. You don’t want to mess with them. You are all culturally insensitive. Cabdriver Thug Morgan Reitzas just wanted to count coup on behalf of the tribe. Morgan was consumed with guilt over what the White Man did to Elizabeth’s land crab eating ancestors and felt compelled to defend Fauxcahontas’ honor from the enemy. No problem,nothing to see here. Reverend who? Reverend Right? Oh, Wright. Now I remember. Wasn’t he a speaker, or something? Elizabeth Warren – the gift that keeps on giving. Lieawatha lies again … and again … and again. I’ve been on countless business trips in my career … not one time did I have a picture taken with a cabbie. I hope Howie Carr writes a column on this. Warren and Obama are cut from the same rotten cloth. Joan Vennochi would like to run interference for Dizzy Miss Lizzy, but Twitchy reports she has been suspended for plagiarism. Do Joan, Fareed, etc., sit around in their pajamas just cutiing and pasting? Under the cab, the under-bus is full. Oh, perhaps you haven’t heard. This is simply a new part of the cab company’s protective service for their fares, especially when it is when one of them is being assailed by a “paleface”. Yesterday it was reported that the “Cabbie” said, “You are messing with the wrong people.” He was right – they are the wrong people. The Collective LIVES by lies. The victim has a cause of action in tort against Warren under both and agency and respondeat superior liability. The victim can also assert accomplice criminal liability against Warren for the actions of her thug. In the victim’s police report, the he can honestly state he was struck by a Jeep Cherokee. In her teepee, Lizzie probably has a photo of our esteemed Professor taped to her dartboard. Once again, Lizzie Warren speaks with forked tongue. Ugh! Freedomworks : It appears Romney and the insiders are inciting an unneccisary fight thru rules and process to minimize grassroots say. Please let this not be true. This feeds what so many of us have feared about Romney and his roots in the establishment. If they keep this up they will piss away what so many of us grassroots have built. They guarantee a 3rd party. Actually, it’s an attempt to keep the Ronulan delegates -who have abused parliamentary procedure to take over several state conventions, even though their boy lost- from wreaking havoc during the convention. The Ronulans have been hinting darkly for some months now about a brokered convention. I now understand why they think they have a chance. It’s one of the most massive acts of spoil-sport immaturity I’ve seen in a while. She acts more Presidential every day. Maybe Valerie Jarrett had Warren thrown out of Washington so she wouldn’t overshadow Obama. “LD 1595, An Act to Impose a Penalty for Making False Claims Regarding Affiliation with a Federally Recognized Tribe – Public Laws 2011, chapter 583. Can’t wait for the curious media to start going through Lizzie’s garbage, to see if they can connect this friend to her family. Had he secretly eloped with a pregnant child of grandma Warren, because it was such a scandal for him to be marrying Indian blood? Body language in that pic indicate Elizabeth and Morgan are intimate? Stay tuned … major media will be on this story soon. Well, the cabdriver doesn’t look Cherokee either. Perhaps he’s from another tribe and part of her Indian Protection Detail. Good thing they are not allowed to carry bows and arrows. Me think’um him is Lillywhite tribe, liv’um South Boston rez. Does anyone know how to investigate whether Lieawatha has household servants, gardener, butler, chef who might be illegal aliens? I just have a feeling there are other “things” in that person’s life that needs to see sunshine before Senator Brown cleans her clock. Will you get a load of those lily-white legs and arms!!!!! If this were the House tv series, someone would preserve her coffee cup or fork for a DNA test. Although, I need no scientific proof other than this picture. Elizabeth Warren: Combining Obama’s Far-left Dreams and Martha Coakley’s Political Skills – With a Native Cherokee Flair! The “cab driver” claim is intuitively false to anyone who viewed that video. “You don’t know who you’re messing with,” said the driver at the end, obviously indicating he is part of the Warren coven. I bet she’s not going to win the Indian cab-driver vote. Either kind. This is typical of the Alinskyite: Deflect, Defame and Deny. If that fails, Destroy. It also shows that like Obama, she is a special kind of stupid. One would think that when telling a huge cover-lie like this, she’d get the ‘cabdriver’ to clean his social media and give him bus fare to some place in rural West Virginia or Pennsylvania where he could hole up for a few weeks. Apparently some as yet unearthed truth about this cab driver was scarier to the Warren campaign than was the 90% chance they’d get caught in an easily refuted lie – while still unsuccessfully fighting off earlier monumental lies. This story may be far from over. I say ‘apparently’, because the necessarily deceitful, scheming Warren campaign team has shown equal evidence of being an ill-run, undisciplined, less than professional political hack artist team headed up by a candidate made of 120lbs of character flaws – including the Maine Dems as well as the national Dems, all of whom are guiding and supporting her run. Could they be this inept? Or is there a damn good reason to risk lying about Warren’s relationship with this young man? In fairness, until I see reason to remove it, I’ll leave on my menu the possibility that her relationship to this man is entirely healthy, not a factor, and he’s just a hothead. But why then lie about him? Kudos x 1,000 + lol x 100 at Professor Jacobson, who has rather surgically stripped away piece by piece all the rotted meat of the Warren campaign, only to find that’s all there is – rotted meat. That’s quite an accomplishment for what is essentially one guy sitting at a keyboard. What a statement about the First Amendment! What a statement about America…. The Prof’s work here brings to my mind the image of our 20lb tomcat ‘playing’ with a captured river rat. Thank you, sir, for Legal & College Insurrection and th work you do. And, what a statement about the internet. Without this communication technology that is able to connect people with each other and convey information without the need for physical publication, this issue would have sunk below the surface and the facts of Warren’s perfidy silenced. For reasons that are beyond my comprehension, when Elizabeth Warren was exposed as a second-rate liar and first-rate opportunist, the liberal establishment failed to act on that information and remove her from the race. Instead, they all looked at each other, decided it was no big deal that Elizabeth Warren committed academic ethnic fraud to land a tenured job at Harvard, and just carried on like nothing had happened. It was jaw-dropping. If it weren’t for the internet in general, and Professor Jacobson’s blog in particular, this issue would have been dropped like a stone by the major news media and the facts around the case discounted as ‘rumors’. Thank you for keeping the subject in people’s attention, and adding a credible voice to the debate. I took cabs and limos at least five times a week for more than ten years and not once did I pose for a snapshot with the driver. Are you a… Cherokee princess? 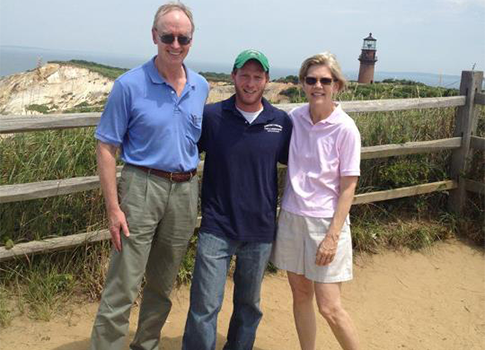 Not only did they meet, they went to Martha’s Vinyard together (the pic is at the lighthouse at the west end of Martha’s Vinyard – I forgot its name, but we took pix there at that exact point a few years ago). It may be called Aquinnah Lighthouse – it looks like it. That is indeed the Gay Head Light at Aquinnah. And, in case anyone says the cabbie just dropped off Warren at the tourist spot and got a quick snapshot with a celebrity, the picture is taken from a location that requires a stroll from the parking lot. The cabbie walked there with her, from the looks of it. Acting as a local tour guide? Perhaps. But I’d say they know each other. Given the breathtaking depth of this woman’s deceit I was going to suggest we check her gender claim but immediately thought better of it. Warren would have been better advised to claim lineage to the “Lost Tribe of Israel”. No one knows who they are or what happened to them.